Distinguished Lecture in the Humanities: "The Work of Art in the World: Civic Agency and Public Humanities"
Home › Events › Distinguished Lecture in the Humanities: "The Work of Art in the World: Civic Agency and Public Humanities"
Doris Sommer, Director of the Cultural Agents Initiative at Harvard University and Ira and Jewell Williams Professor of Romance Languages and Literatures and African and African American Studies, will present for our semesterly Distinguished Lecture in the Humanities. Please register by February 15 to join us for this free luncheon lecture. 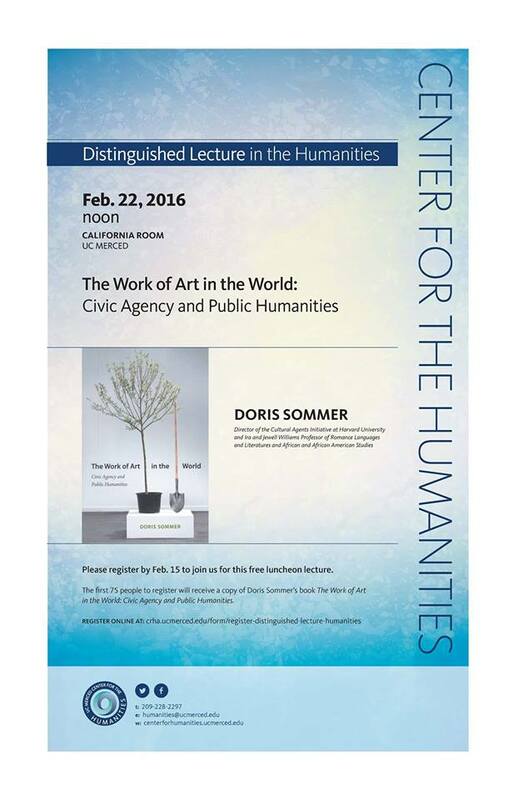 The first 75 people to register will receive a copy of Doris Sommer’s book The Work of Art in the World: Civic Agency and Public Humanities. Register online here.